The mission of the BSD PDA is to serve the Postdoctoral Fellows, Postdoctoral Scholars, Research Associates and Medical Fellows of the University of Chicago by promoting their continued success in the research community and enhancing the quality of the postdoctoral experience for all participants. 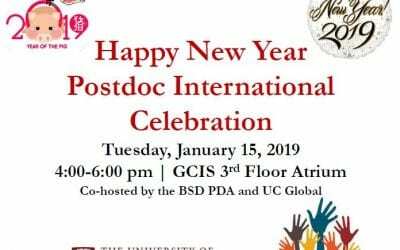 The mission of the BSD Office of Postdoctoral Affairs is to ensure that all postdocs at UChicago BSD are receiving excellent professional and career development training, in addition to outstanding scientific training. The BSD Office of Postdoctoral Affairs and the BSD PDA have compiled many resources for prospective postdocs, current postdocs, and faculty members and administrators who support postdocs. The PDA Seminar Committee organizes weekly seminars and special events and panels, such as the annual Networking Roundtable event. The Biological Sciences Division Postdoctoral Researchers and the Postdoctoral Association are supported by the Office of Postdoctoral Affairs, housed within the Office Graduate and Postdoctoral Affairs (OGPA). Dean and Director of Postdoctoral Affairs Nancy Schwartz, and Assistant Director of Postdoctoral Affairs Valerie Miller support postdoc activities in the BSD. Are you a new postdoc or prospective postdoc? Have questions about postdoc affairs or resources? Contact us! Getting involved with the Postdoctoral Association is a great way to meet other postdocs and expand your network, be a voice for UChicago postdocs, and gain leadership and transferable skills that are prized by future employers!